It's a new year and time for goal-making! 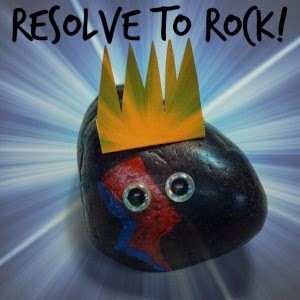 I am so delighted to participate in Storytime Underground's Resolve to Rock in 2015 initiative. They're encouraging librarians all over the blogosphere to post about our professional goals for 2015. When you're done here, please click over to their site to see everyone's awesome and inspiring resolutions for this year. This year, my professional goals are all about... goals! At our Staff Development Day in October, our director announced that due to our new evaluation and merit raise system, our employee evaluations would be due November 14. At that time, we'd be responsible for reporting about our strategic plan progress and evaluating our staff on how they've completed their goals this year. And I had no idea how we were doing! I mean, we had done mid-year reports to the Board in July, but other than that I just had to hope that everyone had been working towards their goals because now we were out of time to look at them and get started on anything. Luckily, everyone had been working hard and completing projects (and we also had a HUGE increase in our school-age outreach this fall, which took priority over some of our long-term goals). But it was definitely a wake-up call for me and my staff. We need to be better at keeping our goals in front of us year-round. As the department head, I need to be the one to spearhead this. 1. I will be setting up brief individual meetings with each of my staff members once a month. (I supervise five currently and we're adding another part-timer this winter, so it'll be six.) The main purpose of these meetings will be to get everyone's goals in front of us regularly. We'll note progress and any stumbling blocks and we'll reevaluate any goals that become irrelevant or impossible. These meetings will also give me one-on-one time with every staff member so they have a space where they can address any issues or questions they may have. We're a pretty close staff and I think we do a pretty good job at touching base with each other casually, but that might not be the most comfortable mode of communication for everyone. People communicate in different ways and setting up an official meeting time might foster communication better for some. It'll also allow me to keep better track of how everyone's doing, what everyone's up to, etc. Again, I think we do a pretty good job, but maybe I don't know what I don't know! 2. I will be getting our goals out in front of us as a department by highlighting one department goal connected to our strategic plan each month. These monthly goals will be posted for all to see in our office and they'll be something everyone can work on. For example, a goal one month might be for every staff person to talk to ten families about our 1000 Books Before Kindergarten Challenge. If I keep up with this throughout the year and make it part of our monthly routine, it's going to be super easy to write up evaluations and report on our goals at the end of the year. What are your professional goals this year? Another Year of Reading Wildly!